Welcome to the engine driven pressure washer page. We can offer a wide variaty of cold water pressure washers and hot water pressure washers driven by either petrol or diesel engines, to suit most types of work. The Viper 140 pressure washer is a powerful performer. 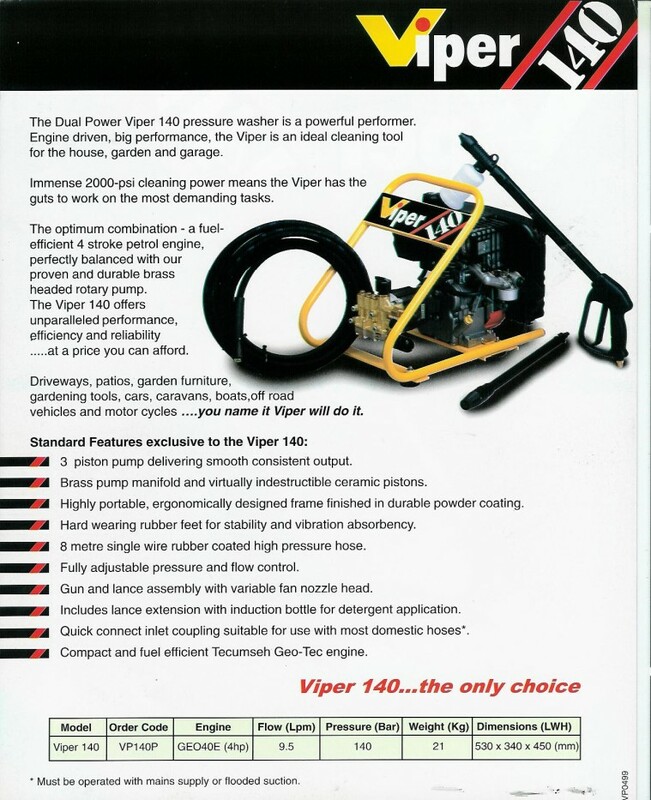 Engine driven, big performance, the Viper is an ideal cleaning tool for the house, garden and garage.Ideal for cleaning driveways, patios, garden furniture, gardening tools, cars, caravans, boats, off-road vehicles and motorcycles and much more. Also available on wheels, see Cobra 140 below. 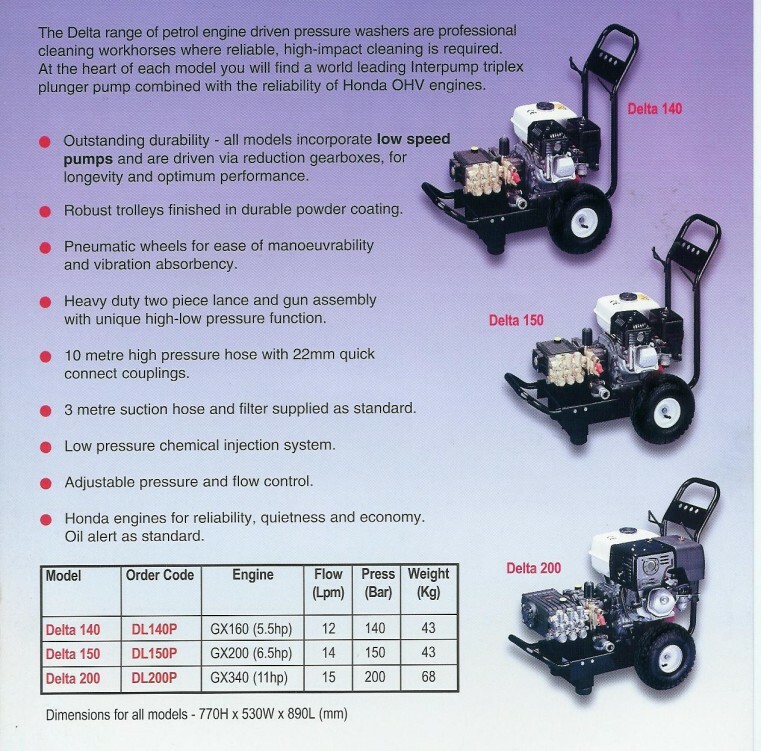 The Delta range of petrol engine driven pressure washers are professional cleaning machines. At the heart of each model you will find a world leading Interpump triplex plunger pump combined with the reliability of Honda OHV engines. The Tecumseh petrol engine driven Cobra is a compact & highly versatile “no frills” pressure washer. Suitable for a wide range of applications & fitted with an Interpump plunger pump it offers an excellent combination of high performance & reliability at the most competitive of prices. The Honda petrol engine driven Cobra is a compact & highly versatile “no frills” pressure washer. Suitable for a wide range of applications & fitted with an Interpump plunger pump it offers an excellent combination of high performance & reliability at the most competitive of prices. These great additions to our Cobra Range of washers all have one thing in common an amazing 200 Bar Pressure. We give you a choice of engines and flow rates but one thing never changes..they all deliver a massive 200 Bar…the only thing that's low are the prices. In the harsh environment of industrial cleaning or the tough world of hire, the Rapier range has the power to deliver the ultimate result Manufactured to the highest standards, all Rapier pressure washers have the strength to tackle the toughest of jobs. Proven design, mechanical excellence and quality engineering ensures long, reliable & trouble free life. This an ideal solution if you need a break tank, or you have a poor water supply, or let your pressure washer have its full water supply flow, or you need to run two machines from one water supply etc. There are many reasons why a suction tank is needed. TYPE A water supply in the side and controlled with a float valve and the suction hose placed into the top, as shown in the photos. Designed for professional users the Zeta packs a powerful punch. With its massive 200 bar at 30 litres a minute it delivers an outstanding cleaning performance. The Zetas amazing cleaning power is achieved by combining a world leading Interpump 66 Series with a rugged 19 Hp Lombardini twin cylinder air-cooled diesel engine. Driven via a 2:1 ratio gearbox the pump is fitted as standard with an automatic speed controller, allowing the engine to run at idle when off-load, reducing noise & fuel consumption. For total flexibility a manual over-ride hand throttle is also fitted to the engine. An easily accessible control panel is fitted with twin high pressure outlets allowing multiple operators to simultaneously harness the Zetas amazing cleaning power. Alston, Barnard castle, Bedale, Bishop Auckland, Consett, Crook, Darlington, Durham, Easington, Hartlepool, Richmond, Ripon, Middlesbrough, Stockton on tees, Guisbrough, Sunderland, Peterlee, Newcastle Upon Tyne, Gateshead, Guisbrough, Redcar, Birtley, Hexham, Corbridge, Middleton In Teesdale, Morpeth, Teeside, Tyneside, Tyne and Wear, wearside.